While in China, WIU Associate Professor Richard Cangro conducted a Chinese orchestra. In China, Cangro presented on cooperative learning to a class of music education majors. Cangro is pictured with his contact in China, Susie, in front of a sculpture on the campus of Nantong Normal College. MACOMB, IL -- Western Illinois University Associate Professor Richard Cangro recently returned from spending part of September teaching and observing classes at Nantong Normal College in Nantong, China, as part of his 2017 Fulbright Teaching Specialist grant award. 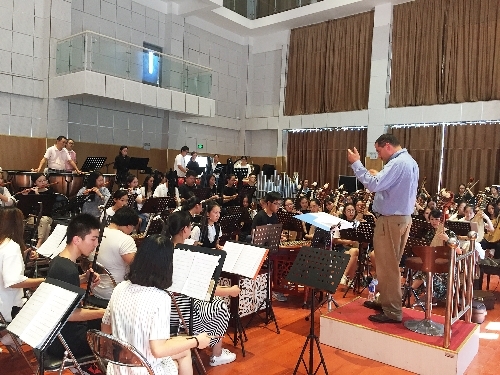 The college, located two hours northwest of Shanghai, has 600 music education majors. Another campus of the college also has an English teacher education program, which sends students and faculty to WIU for summer study. It was through interacting with those visiting teachers and administrators that planted the seed for Cangro's Fulbright project. "Two weeks of observing music education classes, meeting administrators and music artists, touring campuses, conducting ensembles, and teaching classes brought about a fabulous cultural exchange for me, and warm, heartfelt friendships with my hosts," said Cangro. 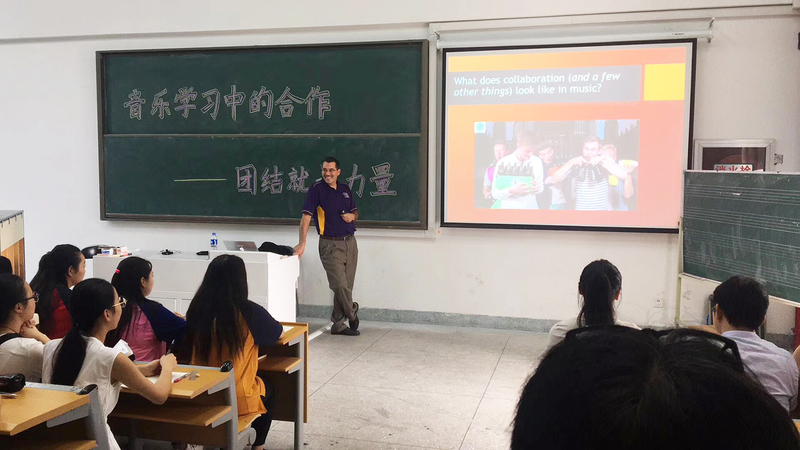 Through translators, Cangro was able to develop an understanding of the Chinese music education curriculum, as well as convey how WIU implements its strategies for effective music learning and teaching. He presented on his research topics focusing on assessing music achievement and cooperative learning in music education, as well as an overview of music education in the US. "One of the most special opportunities for me was conducting the Chinese orchestra," said Cangro. "I was familiar with the instruments of the ensemble, so I was able to take notes and mark the instruments in the conductor's score beforehand, which enabled me to know where to cue in the music. The students enjoyed watching me navigate my way through the Chinese composition. Lots of non-verbal gestures, singing and some of my own goofiness helped get the musical message across when providing directions to the ensemble." 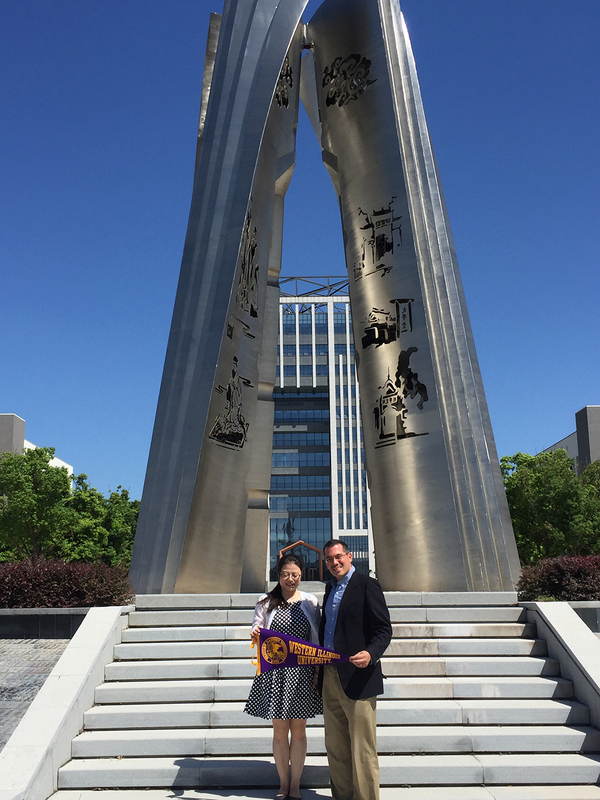 Cangro said he hopes his Fulbright project will help continue the relationship between WIU and Nantong College, and encourages students from both institutions to pursue study abroad opportunities, student and faculty exchanges and partnership degree plans. "China is a wonderful place with warm, welcoming people who love music as much as Americans do," said Cangro. "I can't wait to return." For more information about WIU's music education program, visit wiu.edu/cofac/musiceducation/.